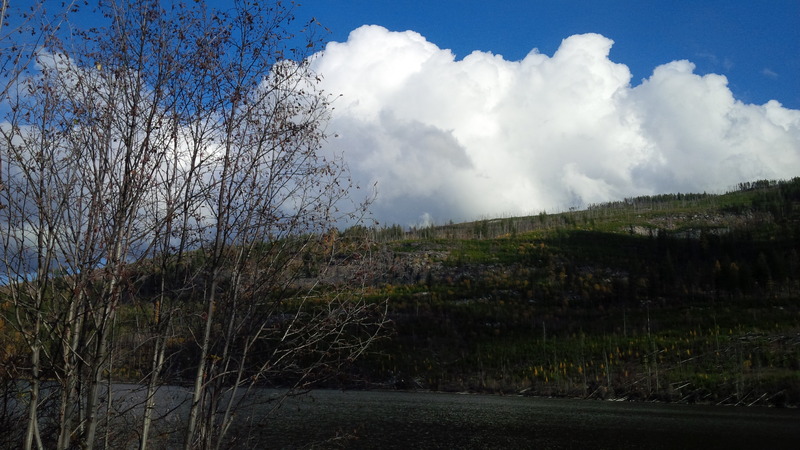 As the Okanagan descends gently into winter, here are a few more views. On a recent sunny day, M. and I went up to Chute Lake. It almost felt like spring except for that sharp autumn-air quality. Water-laden clouds arise more suddenly at this time of year. 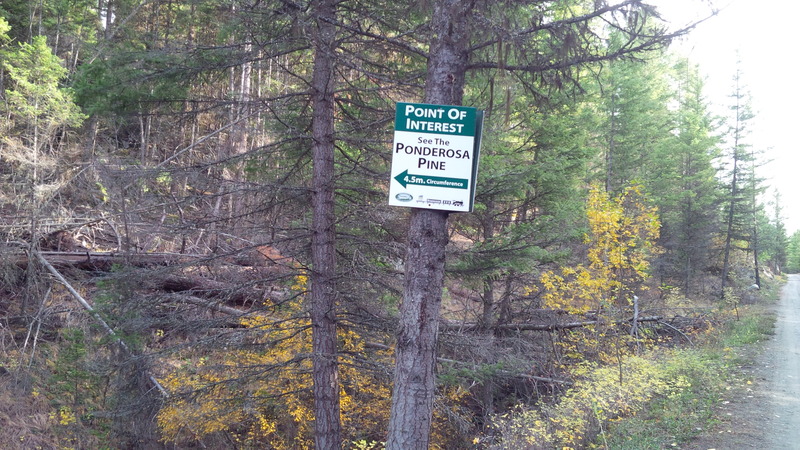 While hiking along a back trail, M. and I found this sign. If you’re metrically challenged, 4.5 metres is 14.76 feet. This is one big tree. Here’s another view. I had to strain my neck to get this tree in the frame. 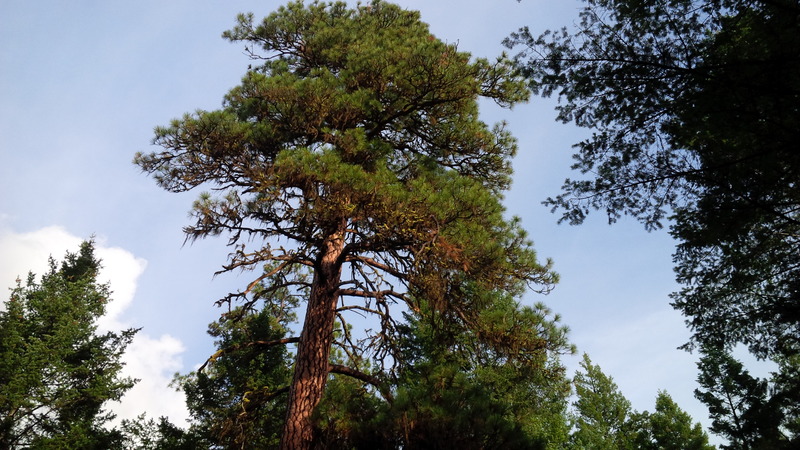 There’s a formula for figuring out the age of a pine. 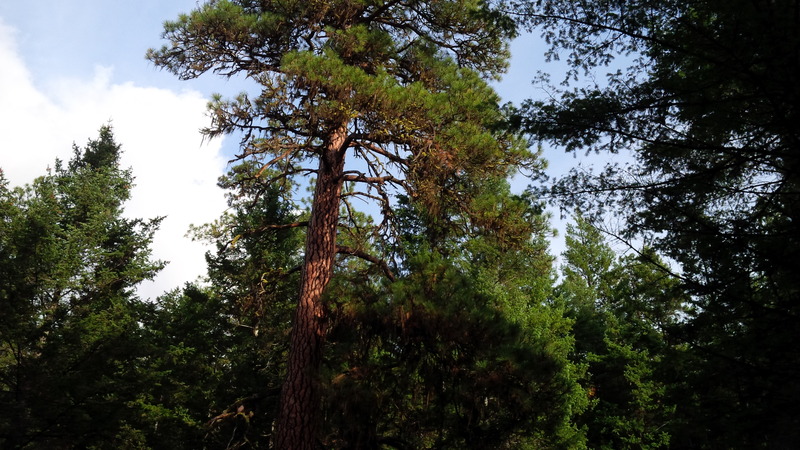 This one’s about the same age as the U.S.
Henry Wadsworth Longfellow said, “We are all poets when we are in the pine woods.” There are lots of pine forests in this area. A couple of days ago, M. and I went to the small mountain town of Rossland, BC. It has produced four Olympian skiers including Nancy Green; two NHL hockey players and a prime minister, John Turner. Pretty good for a town of 4000. 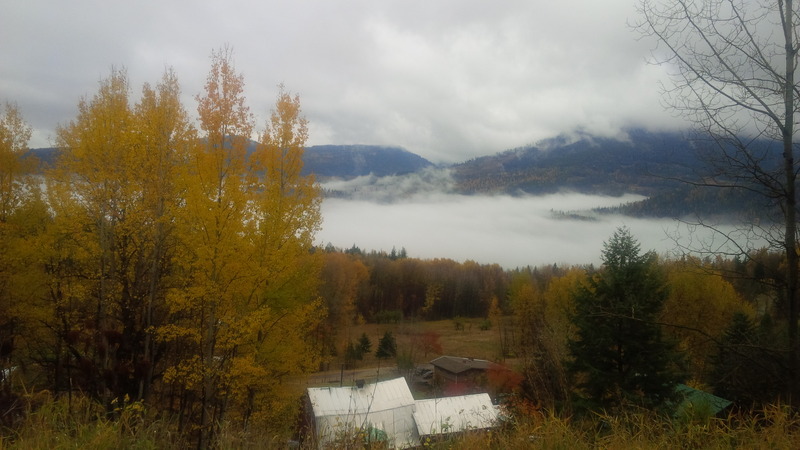 Rossland is under all that mist. 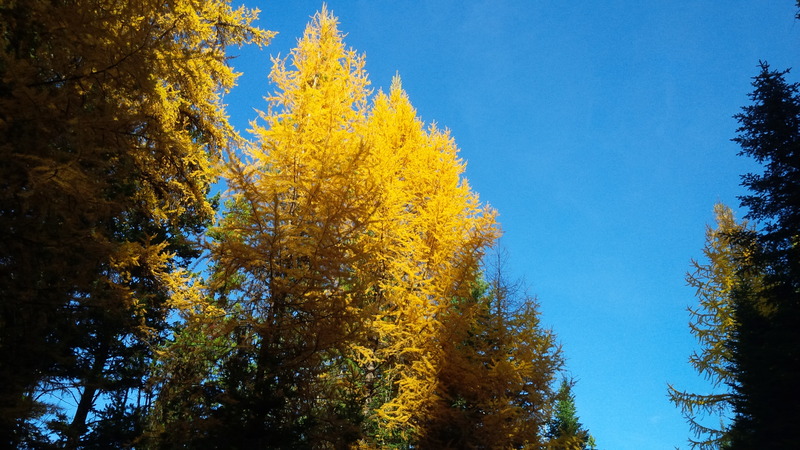 And finally, another yellow tree. What’s fall like where you live? Gosh, I do enjoy your photographs, Lynette! That last shot of the trees is stunning. Sadly, we’ve been so dry, many of the leaves are falling before they’ve had a chance to turn. I’m hoping in the next week or so we’ll get more color. Enjoy! Thank you! 🙂 There’s great material around here. Sorry to hear that it’s been dry out your way – I hope there haven’t been any fires. It looks a lot like the North of my country (sweden) and also like my neighboring country (norway), like we talked about before. 🙂 It is really beautiful! Glad you got to get out there and experience nature up close! Beautiful trees, even of you o gained a sore neck in the process. Lying on the ground may help, an ants view. Autum where we live has the beauty of colour, but unless we travel into the mountains, it’s just suburbia I’m afraid. Yes – an ant’s view would have worked! 🙂 Next time!